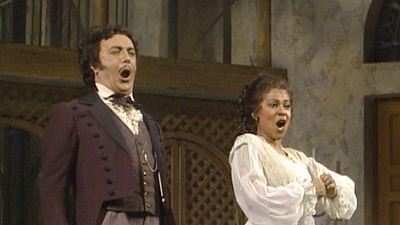 Despite a famously disastrous 1816 premiere, Rossini’s comic romp has become a favorite of audiences everywhere. The mirthful score includes several instantly recognizable arias and ample opportunities for vocal virtuosity and hilarious hijinks. 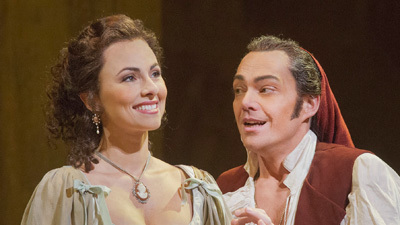 Baritone Peter Mattei reprises his beloved portrayal of the title barber of Seville, while Pretty Yende delivers agile coloratura and sparkling high notes as the clever maiden Rosina. The bright-voiced tenor Dmitry Korchak is Count Almaviva, the young nobleman fighting to win her. Maurizio Benini conducts a spirited performance that also includes Maurizio Muraro as Dr. Bartolo and Mikhail Petrenko as the scheming Don Basilio.